American Flag etiquette is extremely important and US Federal law stipulates rules and protocol to ensure that due respect is given to the most famous emblem of the United States. The flag serves as a symbol of heritage, honor and national pride. The American Flag code provides the rules and protocol in relation to the handling, etiquette and display of the Stars and Stripes. The word etiquette rarely used in modern times. It means the protocol and rules that govern socially acceptable behavior. American flag etiquette is prescribed by authority, to be observed in social or official occasions. It is a ceremonial code of rules and protocol that are described in the US flag code. "No disrespect should be shown to the American flag of the United States of America"
Etiquette: Dipped Flag The American flag should not be dipped to any person or object. The laws relating to the American flag etiquette are detailed in Title 4 of the United States Code. Title 36, Chapter 1 of the United States Code relates to patriotic and national observances. These laws were supplemented by Executive Orders and Presidential Proclamations. The American Flag Code does not prescribe any penalties for non-compliance, nor does it include enforcement provisions. It is a guide to be voluntarily followed by citizens who believe in respect and proper etiquette and that No disrespect should be shown to the American flag. American Flag Etiquette is part of the US Flag Code was first adopted on June 14, 1923 to coincide with the first American Flag Day. The code provides help and guidance to all citizens regarding America flag etiquette and protocol. 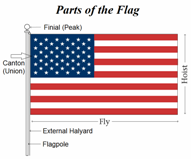 The flag etiquette rules relating to the use and display of the American flag was made law on December 22, 1942. The United States Code allows the President to make any appropriate changes or include any additional rules to the code and protocol.